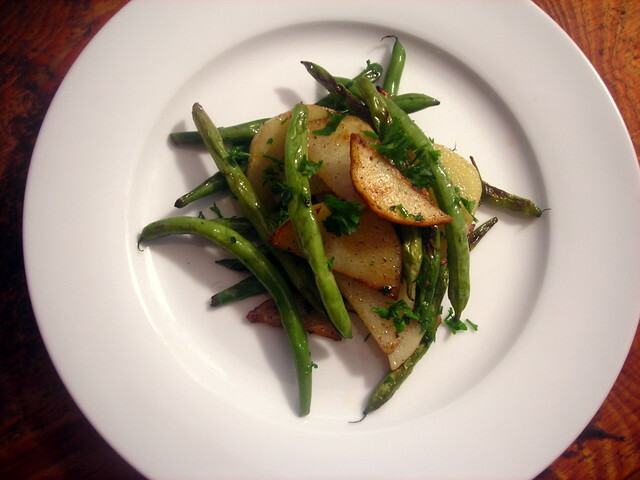 Green beans and potatoes complement each other deliciously. This makes a simple vegetable side dish, or with the addition of perhaps eggs and cheese, can easily stand in for a substantial vegetarian breakfast or lunch. Fagiolini e patate — otherwise known as ‘green beans and potatoes’ in Italian. Boil green beans and peeled sliced potatoes in the same pot, in some lightly salted water, then drain. Next, heat some chopped garlic and olive oil in a skillet; when garlic becomes off-white (after about 1 minute), add the green beans and potatoes, along with a pinch of salt and pepper. Fry until potatoes become golden brown. Taste once more for salt and pepper, sprinkle lemon juice and parsley over the vegetables and serve immediately. 26 Aug	This entry was published on August 26, 2012 at 4:50 pm. It’s filed under food, food photography, Gluten-Free, Italian food, summer, vegan and tagged food photography, gluten-free, green beans, Italian food, potatoes, summer, vegan. Bookmark the permalink. Follow any comments here with the RSS feed for this post. I just tried this recipe & it was magnificent. Thank you. Hello to you as well & I hope you enjoyed a great weekend. Anytime, Jueseppi. Glad you liked it. I like green beans with potatoes. I am going to try you version. Thanks for sharing. I just made a yellow bean and mushroom stir fry. This one is up next with the other half of the beans. Thanks for a great side.